Interweaving these contrasting Baconian and Goethean world-views, Villeneuve presents numerous primary texts - often culled from obscure sources, and many previously unavailable in English translation - with commentary relating to Rudolf Steiner and the nineteenth century. We learn about Steiner's teachers, Karl Julius Schroer and Edmund Reitlinger, as well as English polymath William Whewell. The latter figure was perhaps the greatest admirer of Francis Bacon in recorded history, but maintained manifold connections to Middle Europe. 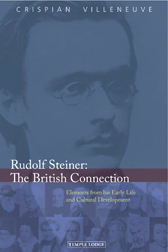 Rudolf Steiner: The British Connection offers genuinely new and valuable research into the early life and thought of one of the greatest cultural innovators of our time. CRISPIAN VILLENEUVE was born in England in 1950 and met Anthroposophy in London in 1973. He has worked for many years in centres of the Camphill Movement caring for people with special needs. He is the author of the two-volume work Rudolf Steiner in Britain. Crispian is also a trustee of the Karl Koenig Archive.